Last weekend brought 75 Wake Forest alumnae of various ages and backgrounds home to Mother, so Dear to hear speakers, take campus tours, share meals together and — most of all — to renew connections with one another. Most who attended WAKEWomen’s Weekend experienced a palpable sense of nostalgia. These days, Wake Forest students, faculty and staff talk a lot about the college motto, Pro Humanitate. We didn’t speak of it so often when I was a student in the early 1980s. But we did talk a lot about community back then and, among my friends in Strings Society, we talked about sisterhood. When we were pledging Strings, we were called Threads. Sisters were called Strings — obviously — graduates were called Ropes, and we used to joke that married graduates were called Twisted Cables. At least, I think that was a joke! We Strings were always accomplished at having a good time together. That’s not too surprising. 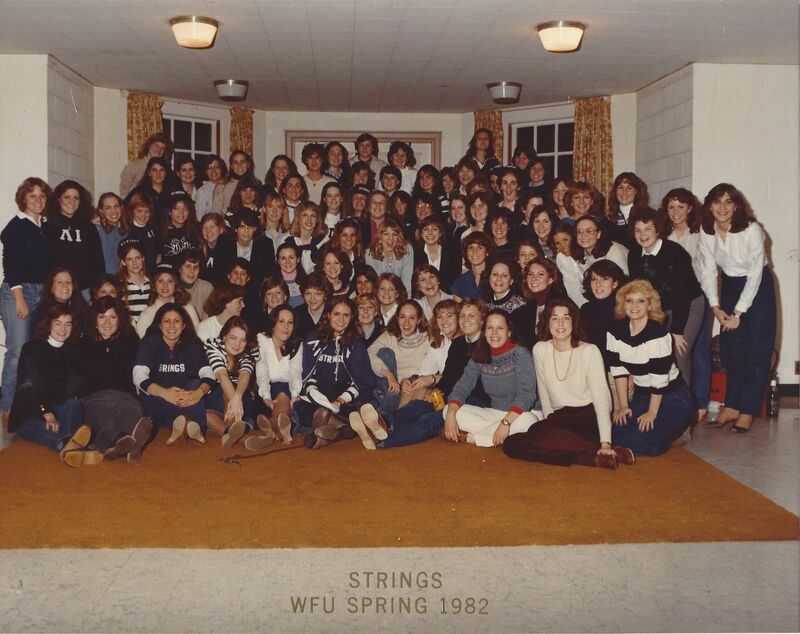 After all, Strings was the original social society at Wake Forest, founded in the 1940s as a parody of Tassels, an honor society that seemed rather stuffy to our original sisters. There were quite a few Strings registered for the WAKEWomen’s Weekend. Getting together is fun and not as rare as you might expect. Various configurations of us get together when time and circumstance permit. I wasn’t at all surprised to hear that my classmates Amy Sanborn Owen (’83, P ’11, ’14) and Zenia Raudsepp (’83) were driving down from Northern Virginia for the gathering or to learn that they were meeting Lisa Rote Lewis’s (’83) flight from Pennsylvania at Raleigh-Durham airport and bringing her with them to Winston-Salem. It is in keeping with what I know about Amy and Zenia for them to go out of their way for someone and then to consider it just what friends do for one another. Friday night brought organized dinner table conversations for some and assorted games at Margaret Brandt Surratt’s (’83, MAEd ’85) house in Winston-Salem for others. I think a few industrious Strings may have managed to do both. After her career as a Wake Forest athlete, Amy’s daughter Courtney (’14) has returned as a volunteer assistant coach of the women’s soccer team. At the end of the evening Friday, Amy, Zenia and Lisa headed to Courtney’s, their home away from home, but Lisa was already feeling ill. Nobody likes to be sick when out of town, but if you must be, then having your sisters there to take care of you is more than a comfort. By early Saturday afternoon, it was obvious Lisa needed medical attention but not clear for some time exactly what was going on with her. Amy stayed with Lisa for hours in the hospital emergency room as test after test determined what was not wrong with her. A little before midnight, the medical staff figured it out. Around 3 a.m., Lisa had an appendectomy. Through it all, her String Sisters tended to her, kept others informed, committed to stay with her until she was released from the hospital and then to drive her up to Northern Virginia where her family members could pick her up. 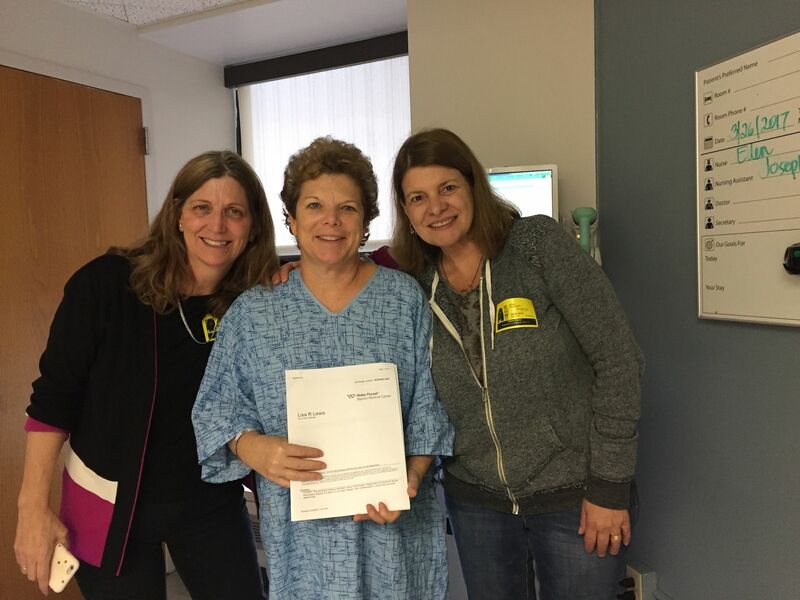 Fifteen hours after an appendectomy, Lisa Rote Lewis (center) was ready to return home with the help of Strings sisters Amy Sanborn Owen (left) and Zenia Raudsepp. We tend to take a narrow view of that term, but I think a more expansive definition is called for here. Amy and Zenia treated Lisa like family. Like a sister. No doubt that care and concern aided Lisa’s speedy recovery. At 6:05 p.m. — around 15 hours after surgery — Lisa posted her hospital discharge photo and even cracked a few jokes on Facebook. She is flanked in the photo by her String Sisters. Who knew WAKEWomen’s Weekend would be such an adventure? After all, the appendectomy came as a complete surprise. On the other hand, the fact that Strings have formed ties that bind is not surprising at all to those who feel the sisterhood.